The main purpose of a 3D mouse is to help you navigate inside your 3D CAD file. The SpacePilot™ Pro does that well. 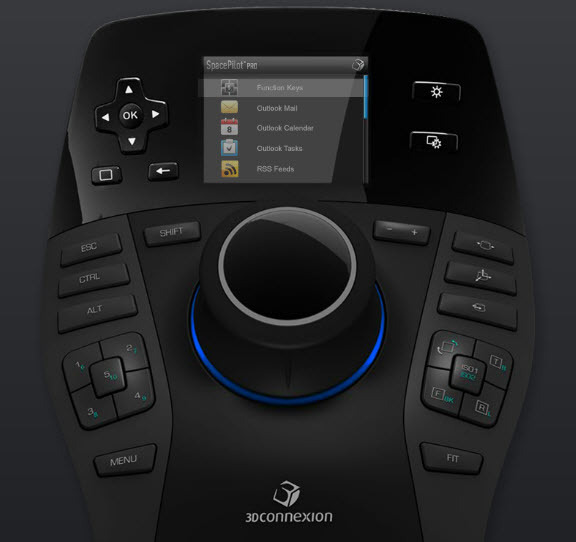 Its controller (called the 3Dconnexion Cap) is an easy to use panning, zooming and rotation tool for viewing your model. It is easy to use and to control. Simply move the controller in any horizontal direction. Push it forward, pull it back, move it left or right, spin it, tilt it, lift it, or roll it. Each movement of the cap changes your view in CAD in a different way. It is very intuitive. One of the coolest features in the SpacePilot™ Pro is the LCD screen. It can act as an additional monitor for your workstation, sort of. It is a full color screen that provides feedback to the user during use and displays the control setting for the mouse. The screen also contains several built in applets. These applets are small programs that will run inside the mouse while it is on. 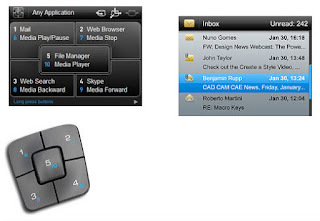 The Function Key Applet displays the commands that are assigned to the mouse’s Intelligent Function Keys. The Mail Applet can be connected to Microsoft Outlook in order to show recently received emails. Pressing the screens OK button will open Outlook on your main monitor. There is also an applet for the Outlook Calendar, Outlook Tasks, and an RSS feed reader. Even though an application you are using isn’t CAD or 3D related, the screen will display information from it as you use it. It may not have any functionality at all or there may be some limited interaction available. The Intelligent Function Keys can be programmed to meet the needs of any CAD program. There are five keys. A short press activates the primary keys (1 through 5) and a long press activates the secondary functions (keys 6 through 10). This gives several programming possibilities to the user. 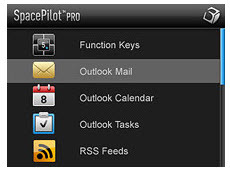 The SpacePilot Pro can be used with many different design software programs and within several different operating systems. It supports Windows, Mac OS, Linix and Unix. For a full list of which specific software you can use the mouse with visit the Supported Software page. Currently the SpacePilot Pro retails for $399.00 (U.S. dollars) and can be ordered on the 3Dconnexion website. If you or those CAD users you support work in a 3D modeling environment all day long then you (they) probably need this tool. It will assist them in many different ways and is well worth the price. CAD-a-Blog gives the SpacePilot Pro a 5 out of 5 rating (five being the best possible score) and a rate it as a highly recommended tool for 3D design professionals.